Loyola University New Orleans School of Nursing professor Laurie Anne Ferguson, DNP, APRN., FNP-C, was named the Advanced Practice Nurse of the Year Feb. 16 by the Louisiana State Nurses Association as part of its Louisiana Nurses Foundation Nightingale Awards. Loyola School of Nursing professor Laurie Anne Ferguson, is the Advanced Practice Nurse of the Year for Louisiana. I have practiced as a nurse practitioner for over 25 years in predominantly rural and underserved populations, before nurse practitioners were accepted or popular. Loyola University New Orleans School of Nursing professor Laurie Anne Ferguson, D.N.P., A.P.R.N., F.N.P.-C., was named the Advanced Practice Nurse of the Year Feb. 16 by the Louisiana State Nurses Association as a part of its Louisiana Nurses Foundation Nightingale Awards ceremony. Ferguson not only teaches in Loyola’s online Doctor of Nursing Practice, or DNP program, and the online masters program for nurse practitioners, she also works clinically as a family nurse practitioner. 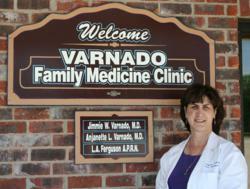 She sees patients of all ages at Varnado Family Practice in Greensburg located in Louisiana’s St. Helena Parish, a designated health provider shortage area. Ferguson is also an integral part of a five-year, innovative colorectal cancer study funded by a $1.3 million grant from the American Cancer Society. "I have practiced as a nurse practitioner for over 25 years in predominantly rural and underserved populations, before nurse practitioners were accepted or popular,” Ferguson said. “I love taking care of patients of all ages. Teaching keeps me current and on my toes as students demand clinical relevance. Students and patients make me a better nurse practitioner." The Nightingale Awards are presented at an annual gala to recognize the achievements of nurses across the state in a variety of categories. Nominations were made by their colleagues and sent to a nationwide panel of 12 judges outside Louisiana for a blind review process. The Loyola University New Orleans School of Nursing offers online degrees for RN-to-BSN, RN-to-MSN, MSN in HCSM, and the Post BS-to-DNP and Post Masters-to-DNP. Loyola’s nursing program is based on Jesuit values and educates professional nurses to lead change and translate science into practice in a dynamic global health care environment. Loyola’s School of Nursing is consistently ranked by both U.S. News and World Report and thebestcolleges.org as one of the premier nursing schools in the country. The online graduate nursing programs at Loyola—the Master of Science in Nursing and the Doctor of Nursing Practice—are ranked in the top six graduate nursing online programs in the U.S. by the U.S. News & World Report 2013 rankings. For more information about the nursing online programs, including application requirements, visit the Loyola School of Nursing website.